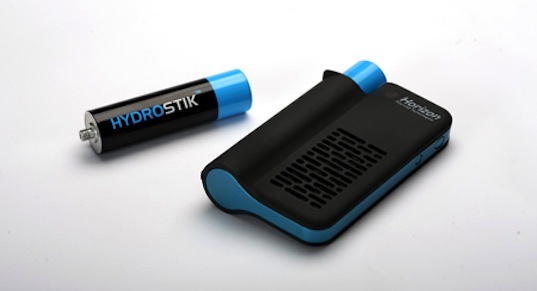 Ever dream of owning a palm-sized fuel cell to juice up your electronic devices on the go? Here’s your chance — Horizon just announced that it has started shipping a “disruptive pocket-size fuel cell power plant” — and it only costs $100 for a unit with two refillable fuel cartridges, each containing the same amount of energy as 1,000 disposable AA batteries. A single cartridge placed in Horizon’s MiniPAK works on any electronic device that needs up to 3W of power — that includes cell phones, MP3 players, and GPS devices. Some more technical details: the MiniPAK offers both an air-breathing fuel cell and a “solid-state” hydrogen storage unit, and the device’s DC power output is 2.5W (5V, 400mA). We’re hard-pressed to see any downsides to the MiniPAK compared to traditional AA batteries. What do you think — would you splurge for one of these? It is pretty fascinating. I'd buy one for the novelty of it. I don't see the light depicted in the image above on the site; is that just for looks or is there a light attachment available for that unit? Having a light with that much power would be like a nearly-infinite flashlight depending on how much power the light discharged. The description seems a touch misleading. While it may have the power of 1000 AA batteries, it can't be directly used in devices that take AA batteries, so it only serves as a charging replacement for devices that charge though USB which draw power from a computer or wall adapter, so you're not saving 1000 AA batteries, you're just having a neat portable charger. I'd have more confidence buying one if they had a shopping cart on their website. Right now, clicking on "Buy Now" just opens your email client to send them an email. The downside is that the website actually says: "It's the first fuel cell product to compete on cost with both disposable and rechargeable batteries with just one refillable cartridge supplying as much power over its life as 1000 disposable AA alkaline batteries." Note the "over its life" part... Not much different than existing rechargeable solutions. This thing is simply AWESOME; very much worth the money. The problem is of course recharging it (would add enormous overhead). Ever bought a set of four rechargable AA's? If this thing can provide power of 1000 AA's, it makes it a great solution for people heading out into nature or remote places for long periods of time. I've had problems recharging batteries while travelling, as the charge time for 8-12 AA's plus a digital camera is far longer than the time I have with a power receptacle. For $100 USD, this is worth the price (as far as I am concerned) just as an emergency power solution. Imagine being able to charge your cell phones for weeks when there is no power (would not garuntee the cell towers have power however)! I want one! Ever dream of owning a palm-sized fuel cell to juice up your electronic devices on the go? 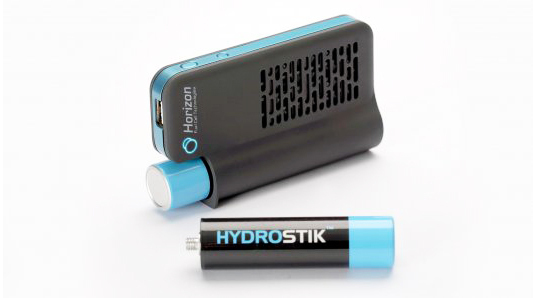 Here's your chance -- Horizon just announced that it has started shipping a "disruptive pocket-size fuel cell power plant" -- and it only costs $100 for a unit with two refillable fuel cartridges, each containing the same amount of energy as 1,000 disposable AA batteries.